Kabul - The Afghan Taliban have killed 37 Personnel of Afghan Security Forces in different attacks in Afghanistan. According to Mohammad Yousaf, head of the provincial council of province of Kunduz, the Taliban targeted Security personnel near the Czech post in Dashti Archi district in which 37 personnel were killed and 15 were injured. The fight between the Taliban militants and Afghan Security forces was started from Sunday night and continued till the morning of Monday. Meanwhile, The provincial police chief Gen. Faqir Muhammad Jawzjan said the Taliban attacked Afghan security forces in different parts of the district Khomab and Jawzjan so that they could retreat from the district. On the other hand, Taliban spokesman Zabiullah Mujahid acknowledged the responsibility for the attacks in Kunduz and Jawzjan. In this regard, he added that the Taliban targeted 14 Afghan Local Police officers in Samangan province. Provincial spokesman Sadiq Azizi said six policemen were injured in Taliban attacks. Nobody accepted the responsibility for the attack in Samangan, but Sadiq Azizi claimed that the Taliban are active in the province and they have targeted Afghan security forces. On the other hand, provincial police chief General Abdul Qayyum said in a statement that the Taliban's attack on the check post killed two armed men and injured 2. He further said that the Taliban's attack was strongly retiliated, and still there was a little fight outside the city. 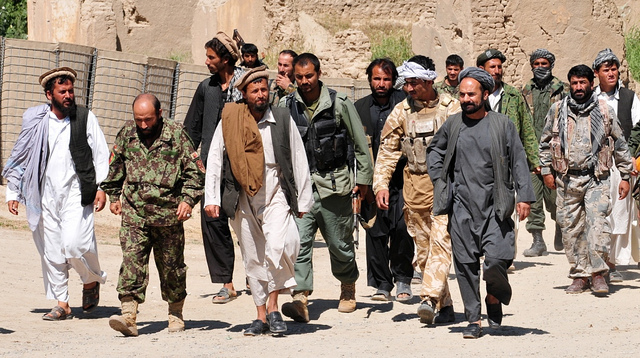 The Taliban did not confirm fighting in Sar-e-Pol province.